STUDY | Spend the week studying Matthew 5:43–48 and 22:34–40. Consult the commentary provided and any additional study tools to enhance your preparation. LANDING POINT | My love for God and others defines me as a disciple of Jesus. Love. It’s the most powerful word in the English language. The first time someone in a relationship says “I love you” to their partner, his palms are sweaty and his throat dry. Why? Because he knows those words have weight. Love isn’t an idea. It’s not a chemical reaction in the body. It’s more than the feeling. Love is a Person. The Apostle John tells us “God is love.” But God doesn’t just tell us He is love. He showed His love by sending His Son. In Jesus we see true love lived out. Q: Recall a story from your life where you saw love in action. Share it with the group. This week and throughout this series we’re going to discuss the DNA of Pinelake. 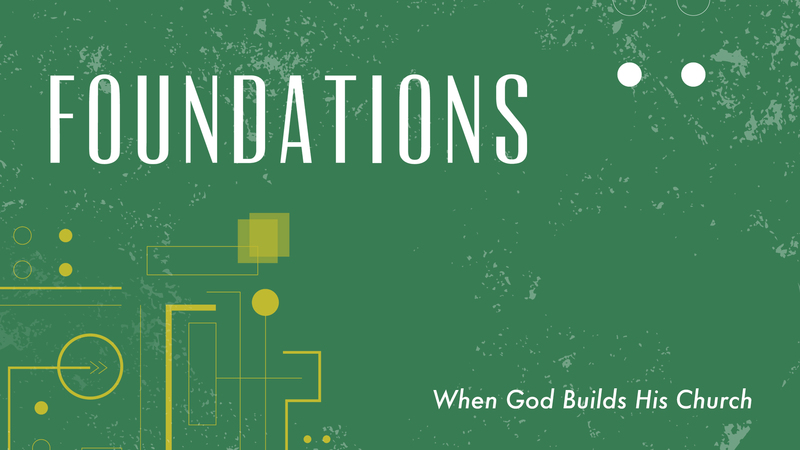 What are the foundations of our community? What defines us? What traits do we want others to see in us? Our love for God and others defines us as disciples of Jesus. It’s the first and greatest character trait. Without love, it’s impossible to live out the others. Jesus calls us to love like He loves. Love for God and others is the bedrock foundation of our faith. Q: Explain why love is the first and greatest character trait for a Christian. The Pharisees were the most respected religious leaders in Jesus’s day. They had a reputation for going to extremes to follow every jot and tittle of God’s law. Remember that annoying kid who sucked up to the teacher and tattled on anyone who broke the rules? Well, that’s what the Pharisees were like. Legalistic rule followers who thought being “good” and always doing right made them better than everyone else. Read: Read Matthew 22:34–40. In what way was the lawyer Pharisee trying to trap Jesus with His own words? Q: How are these two commands to love related? This was unlike any other teaching at the time. Love your enemies? Pray for those who persecute you? Many in the crowd might have walked away at this point. But Jesus was setting a new, radical standard of living for God’s kingdom. He wasn’t calling them to live conformed lives, but to live transformed lives. Q: Describe the differences between a conformed life and a transformed life. Q: How might praying for your enemies change your attitude toward them? Jesus taught us to look at love in two spheres or types, vertical and horizontal. The first and greatest commandment to love God with all your heart, soul, and mind refers to your relationship with God (vertical love). To love your neighbor as yourself and to love and pray for your enemy is the way we love horizontally. How do we show someone we love them? We find out what pleases them and do everything in our power to do it. Love for God starts with obedience, with a commitment to live our lives in a way that pleases Him. Obedience means we don’t allow our feelings, emotions, or anything else to stand in the way of doing what God calls us to do. Q: Give yourself a heart check-up. How would you evaluate your vertical and horizontal love on a scale of one to ten? Explain. Q: What stubborn sins keep you from being obedient to God? When we experience the love and grace of God through Jesus, it changes us. That’s why Jesus put love for God as the greatest commandment. That’s why He came—to show us love in action and what it looks like to live our lives with and for God. When we love God with all our being, His love makes its way into every area of our lives. It changes our behavior, motivation, and priorities. It makes us see the time, talent, and treasure God has graciously given us in a much different way. Q: What area of your life most needs to be changed by love right now? Jesus came to serve and give His life for others. He loved the poor, the sick, and the needy. But it also tells us that while we were still sinners, Christ died for the ungodly. This is radical love. Jesus loved His enemies all the way to the cross. Grasping this kind of love gets us one step closer to understanding grace. And there’s no greater motivator for obedience and joy in our lives than knowing we’re sinners who desperately needed (and still need) God’s grace. Q: What’s one thing you can do this week to show God’s love in a real way to someone who needs it? The gospel is a love story. It’s the story your heart longs to hear. That you are loved by Jesus who “saw your heart to the bottom but loved you to the skies.”1 Jesus knows every dark corner in your heart and, yet, He loved you enough to see through the darkness and take the journey to the cross. He suffered the judgment for sin and terrible wrath of God so you could be forgiven and freed to live life as it was meant to be lived—with a heart full of love for God and others. Q: Do you feel like something is missing or broken in your relationship with God? Or is it hard for you to receive love from Him and others? Write down what you long to hear God to say to you as a response. Q: Why is it necessary to understand the bad news of our sinfulness and brokenness in order to understand God’s love demonstrated in the good news of the gospel? Spend time in silent prayer meditating on God’s love for you. Then, as a group, praise God for His love and grace seen in Jesus. Finish by praying for God to expose any sinful “heart blockers” so you can be free to love God and others. Read John 13:34–35 and reflect on how love for one another is a powerful witness of the gospel to those outside our community. Ask the group to share any stories or lessons learned where they see God at work in their life. The “greatest commandment” Jesus speaks of in Matthew 22:37 refers to Deuteronomy 6:5, which was and still is recited twice a day by faithful Jews. The command to love your neighbor as yourself comes from Leviticus 19:18 and 34. 1. Timothy Keller and Kathy Keller, The Meaning of Marriage: Facing the Complexities of Commitment with the Wisdom of God (New York: Riverhead Books, 2013), 184. 2. D. A. Carson, “Matthew,” in The Expositor’s Bible Commentary: Matthew–Mark (Revised Edition), ed. Tremper Longman III and David E. Garland, vol. 9 (Grand Rapids, MI: Zondervan, 2010), 191.